Proposals are essential for any organization, as they decide the success or failure of an organization. Writing proposal is one of the most critical aspects for any non-governmental organization to raise funds from the donors. It helps in cultivating the relationship between the NGOs and donors over a project. Writing proposal is not an easy task to perform, it involves a lot of brainstorming and learning from the past. As an NGO, you must be aware that it is both the uniqueness and the presentation of the proposal which is required to get the desired funding. Writing a clear, thorough and targeted project proposal is therefore vital to an NGO’s success as it is the medium of projecting your thoughts to the outside world. Donors always expect an exceptionally innovative, practical, methodological and well-documented proposal from the NGOs. Fundraising is a great challenge. Therefore your proposal should be crisp, informative and to the point so that it appeals to the eyes of the funder. In recent years, we have seen an enormous growth in proposal writing that reflects the competitiveness among the NGOs. But still, there are many small NGOs that are left out in this competitive world. The purpose of this guide is to enlighten NGOs on proposal writing. This guide brings you some of the tips given by donor agencies that will help you to write proposals that are more likely to succeed. 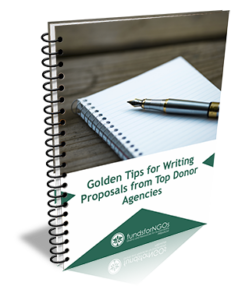 To get detailed information, you can download this guide on “Golden Tips for Writing Proposals from Top Donor Agencies” available exclusively for our premium members. If you are a FundsforNGOs Premium Member, you can download this document by logging in here.